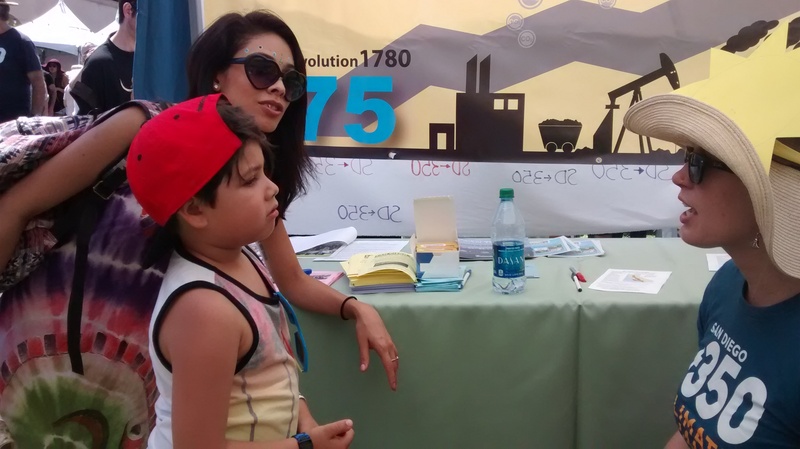 SanDiego350’s Presentation Team has been busy spreading the word about climate change throughout communities in the San Diego area. Team volunteers Beverly Harju, Ron Schneider, and Nancy Cottingham spent April 11th with students in Michelle Roberts’ Biology classes at Southwest High School. 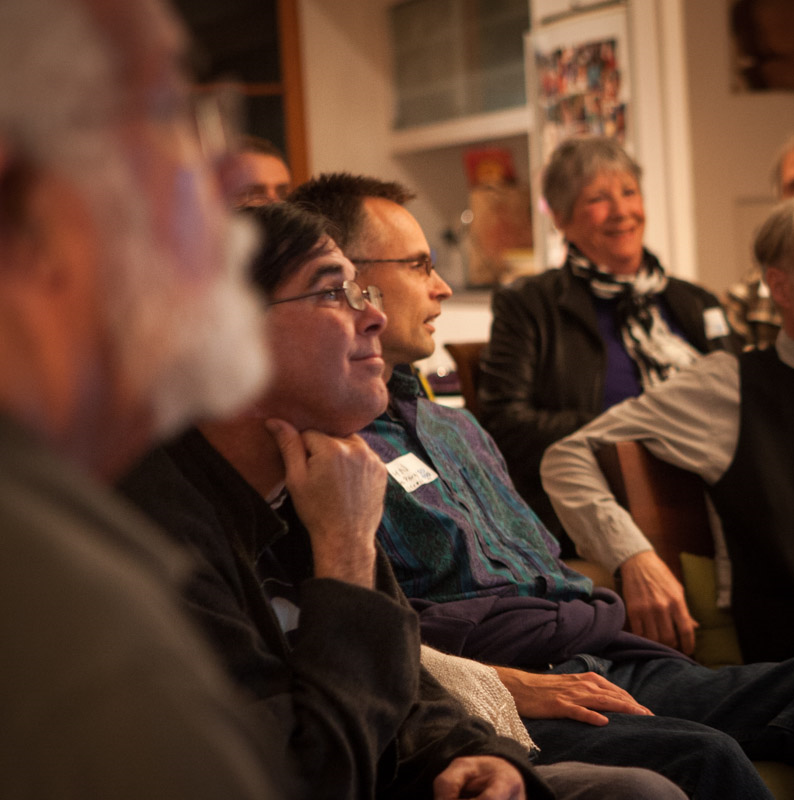 Michelle is a SanDiego350 member and is dedicated to teaching the next generation about the serious issues facing our planet and the concrete steps they can take toward building solutions. 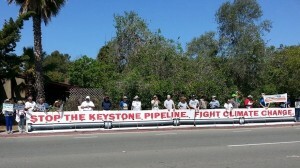 Thursday, May 8, 2014 – Over 100 San Diegans gathered along Torrey Pines Road in La Jolla to call on President Obama, who was in the neighborhood for a fundraiser, to reject a permit for the Keystone XL Pipeline. The “KXL”, which would carry dirty tar sands oil from Canada to Texas for refining and export, has been called “game over” for the climate by the nation’s foremost climatologist, Dr. James Hansen. Participants held large signs, including a 50-foot cardboard depiction of the Keystone Pipeline with the words “Stop the Keystone Pipeline. Fight climate change” in huge letters on it, and a large banner with a quote from the President that participants want to see him keep: “We will respond to the threat of climate change, knowing that the failure to do so would betray our children and future generations”. As a Registered Civil Engineer, I oppose the proposed Keystone XL Pipeline because I know it will leak and there will be oil spills. Nothing is ever engineered to 100% because it’s just not affordable. Additionally, factors such as human error (in design, construction or operation), material flaws/failure, and unpredictable accidents make the probability of pipeline spills high. Case in point: Enbridge, a Canadian company, had a pipeline rupture in 2010 which poured a million gallons of tar sands oil into the Kalamazoo River in Michigan. It was eighteen hours before it was even discovered! It was the largest and one of the costliest on-land oil spills in U.S. history. The six-foot gash in the pipe was caused by corrosion fatigue. Case in point: In April 2013, a twenty-two foot crack in an Exxon pipeline caused a devastating tar sands oil spill that began in a residential neighborhood of Mayflower, Arkansas and then flowed into Lake Conway, a drinking water source and popular fishing spot. The EPA classifying it as a major spill, with over 5,000 barrels of crude spilled. Case in point: TransCanada’s first pipeline had more than a dozen spills in less than a year of operation. The more acidic and corrosive tar sands oil and the risk of external corrosion from higher pipeline temperatures make spills more likely. Tar sands crude is one of the world’s dirtiest fuels. A pipeline accident could devastate ecosystems, pollute water sources and jeopardize public health. The Keystone XL pipeline would span more than 1,700 miles through farmland and fragile ecosystems, from Alberta, Canada to the Gulf Coast of Texas, where it will be refined and exported. The Keystone XL pipeline would cross six states, major rivers, and key sources of drinking and agricultural water, such as the Ogallala Aquifer which supplies water to more than one fourth of America’s irrigated land and provides drinking water for two million Americans. During tar sands oil production, the carbon dioxide emission levels are three to four times higher than that of conventional oil. 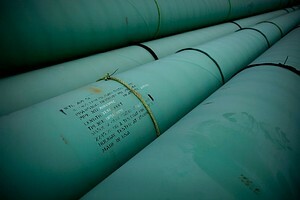 The pipeline would be responsible for 30 million tons of carbon dioxide emissions per year. The energy-intensive extraction and refining processes also result in higher emissions of toxic sulfur dioxide and nitrous oxide which cause smog and acid rain. In considering the Keystone XL pipeline proposal in 2013, the EPA recommended to the State Department that pipelines that carry bituminous sands oil should no longer be treated just like pipelines that carry any other oil. Additionally, the pipeline will create higher carbon emissions, contribute dramatically to climate change, and threaten our country’s drinking water. This pipeline is not in our national interest. As a Registered Civil Engineer, I am aware of previous pipeline ruptures and spills. I’m concerned about the integrity of the pipeline from corrosion, faulty welds, material defects, construction equipment and sabotage. 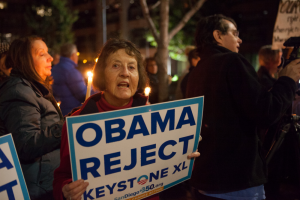 I believe the Keystone XL pipeline should NOT be approved. Thank you. About the Author: Jösan Feathers worked as a Civil Engineer for Caltrans and State Parks for 30 years before retiring almost 5 years ago. She and her husband enjoy attending SDSU Aztecs basketball games, traveling and dog-sharing their neighbor’s dog, Rupert, in La Mesa. She volunteers with SanDiego350.org. This text by Jösan Feathers is used here by permission of the author, and is licensed under a Creative Commons Attribution-NonCommercial-ShareAlike 3.0 Unported License. The damage caused to our atmosphere and our oceans by carbon dioxide that has been released by burning fossil fuels is abundantly clear. The consequences are increasing year by year – acidified oceans harming coral reefs and diatoms (the basis of the oceanic food chain); huge changes in atmospheric patterns that are producing storms and different rainfall and temperature regimes than have been in place for at least 500 years, altering agriculture, silviculture, and the survival of entire ecosystems that are responsible for our hydrological systems. Without reductions in our CO2 output, science has predicted to a high probability that the extreme changes may come to reflect conditions not witnessed in 100,000 years or longer, if we don’t alter our production of CO2. Leaving fossil fuels in the ground is the best way to stop their use. They are also extraordinary resources, and burning them to power cars, trains, and trucks is absurd in an era when other ways to power these ground transportation devices are available. We will really regret the lack of fossil fuels for those situations for which they are uniquely appropriate if we burn them all up just to roll people from place to place. Some say that Keystone XL helps the US achieve energy self-sufficiency. Energy self-sufficiency in the US isn’t gained by the US refineries buying Canadian crude from tar sands. This simply guarantees the Canadian companies will make a lot of money. It is good that the US is seeking to be self-sufficient in our energy requirements. However, our national priorities for energy self-sufficiency have been co-opted by the current energy corporate hegemony, to encourage the continued reliance on fossil fuels. If we prohibit the use of Keystone XL pipelines for transporting tar sand oil, this will slow down its production. British Columbians are barring pipelines to the Pacific Ocean. People in the NE US are coming together to prohibit transport across their states to the Atlantic Ocean. The rest of us need to prohibit transport across the middle of the US to the Gulf of Mexico via Keystone XL. If we also follow up with mandatory reductions on shipping by rail or truck this would further constrain the Canadian excavation and shipment of tar sands oil. If, as claimed by a number of critics of Keystone XL pipeline, the refined products are going to be sold to overseas markets, this makes a travesty of the idea that Keystone XL is helping the US be energy self-sufficient. It simply means that the refineries will make money regardless of the long-term needs for fossil fuels in the US for appropriate purposes. If fossil fuels could be used without releasing CO2 that would be great. Where is the research for that? In the meantime, the only way to reduce CO2 releases is by conservation and by replacing fossil fuels used for generating electricity with solar, wind, tide, heat-pumps, and other already proven technologies that are improving efficiency every year. These, and other as-yet-unknown technologies that might become useful if they are proven to be benign in their impact to the environment (unlike nuclear power which is a very dangerous form of energy production) are the means to energy self-sufficiency and global climate protection. Ground transportation can also be converted to greatly more efficient use of fossil fuels – hybrid vehicles work great! Our priorities must be switched to solar and wind generated electricity, conservation measures for fuel for heating and transportation, and anything else that we can do to reduce use of fossil fuels. The stakes are immense. Thanks for considering my point of view and facts in your decisionmaking. About the commenter: Kay Stewart is a volunteer with SD350.org and landscape architect with a special feel for melding plants and construction to create serene or playful outdoor places for her clients. She lives with her husband and her tabby cat. Submit your own comment at the State Dept Website: http://www.regulations.gov/#!submitComment;D=DOS-2014-0003-0001 by March 7, 2014. You can also submit comments via 350.org. This text by Kay Stewart is used here by permission of the author, and is licensed under a Creative Commons Attribution-NonCommercial-ShareAlike 3.0 Unported License. California Teachers for Fossil Fuel Divestment and SanDiego350.org sincerely thank the California Federation of Teachers for backing a resolution calling for CalSTRS and CalPERS to divest from fossil fuels. Your bold step in asking the two largest pension fund investors in the United States to remove the collective wealth of the education workers you represent, workers that spend their professional lives preparing others for the future, from being used in the fossil fuels industry, is the kind of tectonic shift this world needs. Climate change must be addressed now and that means radically reducing our dependency on fossil fuels. Every fossil fuel tentacle, every branch that can be cut moves us forward in stopping our dependency on fossil fuels. The tentacle you have asked to be cut is a tentacle that relies on the income produced from investing in fossil fuels. There is no denying that the fossil fuel industries provide the best return, the best bang for the buck, and we have a significant amount of our collective wealth in our CalSTRS and CalPERS pensions invested in fossil fuels. However, we must look beyond today, this quarter, this year; we must think about the coming decade or two. The science of climate change is very clear; we have at most a decade to begin taking bold action to avoid the worst that climate change could bring. So we are faced with a choice: begin significantly cutting our fossil fuels dependency now and maybe face an economic issue manifested to us in CalSTRS and CalPERS by a drop in investment revenue brought in by fossil fuels, or don’t cut our fossil fuel dependency and face broad environmental and social catastrophes unheard of by humankind. If in this critical decade, we the people demand real action on climate change and that demand is followed by real action to greatly reduce our carbon dioxide emissions, the value of fossil fuel stocks will drop and those holding them will take the hit. Action on cutting carbon dioxide emissions doesn’t mean that we don’t provide alternatives in energy, and investing in these alternatives on a scale to meet the demand of replacing fossil fuels presents great opportunities for pension funds like ours. If action isn’t taken on carbon dioxide emissions, the continued holding of fossil fuel stocks may not matter much in the decades ahead. As our youngest teachers begin to retire, what effect will our current choice of investments have on their future? Global insurance firms, military planners, government agencies dealing with water for agriculture and inland water transport, and many coastal communities and nations all see climate change as the most significant threat to the future for maintaining stable societies everywhere. How will a portfolio heavily invested in fossil fuels look thirty years from now if the threat of climate change is real? What future will there be for our students? Divesting from fossil fuels is not just a sound proactive step to protect our collective wealth; it is an action that speaks to others that now is the time for action, for after now there will be no time left to make a difference. We ask you to go to our website, www.teachersfordivestment.com, and sign our petition. It’s going to take all of us working together to bring about the change that is needed. It will take the kind of leadership the CFT showed in choosing to support the resolution for fossil fuel divestment. CFT has boldly stepped forward and reinforced that California educators are about preparing others for their future, and that their students will not be facing a radically different planet due to climate change. We at California Teachers for Fossil Fuel Divestment and SanDiego350.org applaud your actions.